Wirtz is a Denver based keyboardist and composer who has performed mainly as a sideman for the last decade or so. 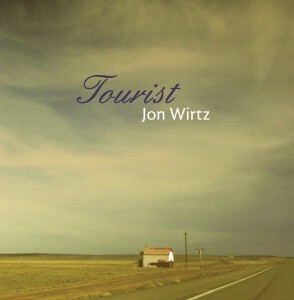 Tourist is his second album, a follow-up to his 2010 debut Sea Level. His forte is a sort of an expressive laid-back jazz piano style, though on the ten tracks here he mixes things up quite a bit, and as such the result stands up to repeated listens without getting too samey. Wirtz, drummer Alejandro Castano, and bassist John Grigs are the core trio that are featued throughout; in addition, he has surrounded himself with some great guest players and occasional vocalists that compliment what he’s doing very well. While most of a track like “Despite Appearances (All is Well)” could easily pass for something by Keith Jarrett, following the build up half way through, some distorted electric guitar starts firing it up in the backgound, belying the tranquil scene that the piano, bass and drums have created. “Gratitude” is a gospel flavored jazz piece with some spoken rap by guest vocalist Jess DeNicola, and supported by a couple female backing singers. Easily the album’s standout, “Country” is an uptempo piece that could easily pass for an outtake from Dave Grusin’s On Golden Pond soundtrack. “In the Body” is a seriously beautiful introspective solo piano piece that segues seamlessly into the closing track “Awakening,” carrying the feeling forward with the full trio plus solo trumpet. While this wasn’t an album that jumped out and grabbed me on the first listen – in fact it left me a bit confused, further listens began to reveal its sincere warmth and sensitivity. Hopefully it will do the same for others.